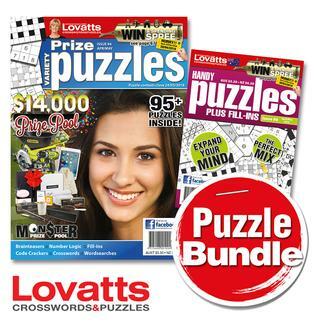 PLEASE NOTE: Your subscription will consist of 6 issues of Variety Puzzles and 6 issues of Handy Puzzles. Both titles will be sent bi-monthly and you will receive a copy of each within the same month. Lovatts puzzle books keep my mind sharp and fills in my quiet days. i look forward to tackling different types of puzzles including sudoku, cryptic crosswords, find a word, code crackers and fill ins. I am 73 years old and homebound due my husbands health so I rely on these books to occupy my time.